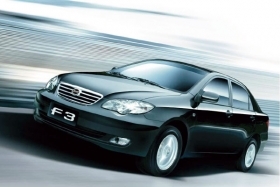 The BYD F3 sedan was the best-selling passenger car in China last year. MOSCOW (Bloomberg) -- BYD Co., the Chinese automaker partly owned by billionaire Warren Buffett, started assembling cars in Russia, BYD’s local partner TagAZ said. TagAZ completed assembly of its first BYD F3 sedan, the best-selling passenger car in China last year, the Taganrog, southern Russia-based company said on its Web site. BYD may produce 10,000 cars at TagAZ by the end of the year and replace South Korea’s Hyundai Motor Co. as the Russian factory’s main partner, the Kommersant newspaper said Tuesday, citing unidentified TagAZ workers. TagAZ makes about 40 percent of the cars Hyundai sells in Russia, according to Kommersant.